What is Quito’s Fiesta de la Luz (Festival of Light) 2018 Event? Located at 2,800 meters (approx. 9,000 feet) above sea level, the vibrant city of Quito shines in the heart of the Andes, calmly sitting at the base of the still-active and colossal Pichincha volcano. 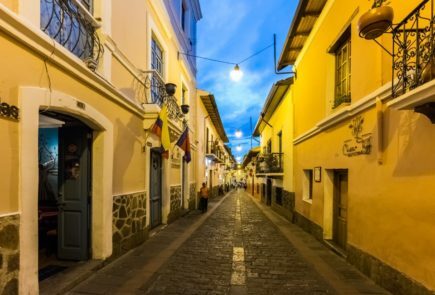 Ecuador’s capital city is home to one of Latin America’s best-preserved Colonial Districts, which happened to one of the very first places on the planet to receive UNESCO’s title as a World Heritage Site and, not to mention – the first city in South America to announce its independence from Spain. In light of the latter, Quito’s Fiesta de la Luz serves as a commemorative event that pays homage to the country’s history. The spectacular view from Casa Gangotena’s rooftop terrace! Why, when, where and how does Quito celebrate the Festival of Light? 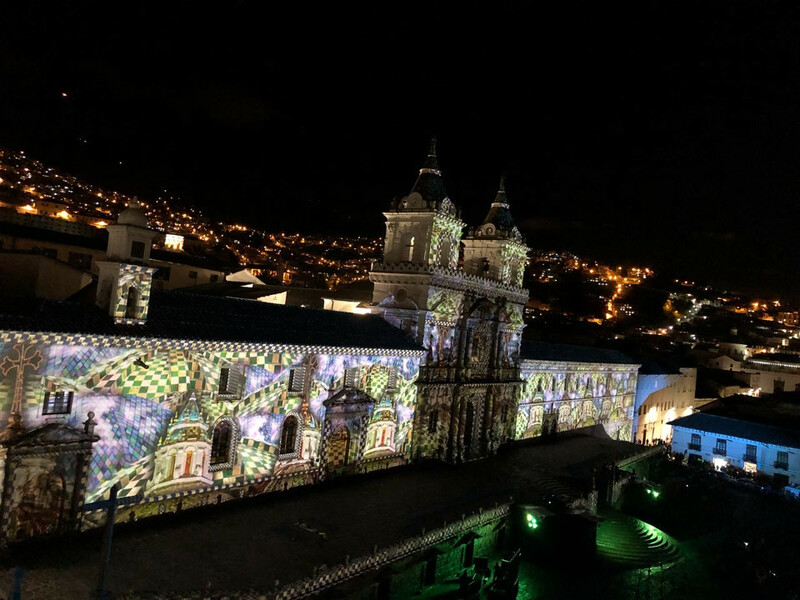 Quito’s Fiesta de la Luz 2018 (Festival of Light) is meant to commemorate the fact that, on August 10th, 1809, Quito officially announced its plans to become independent from Spanish rule. The date is now an official holiday in Ecuador and is referred to as the “Primer Grito de la Independencia” in Spanish (literally: the first cry for independence). You can learn all about the date and its significance with our blog on: Ecuador’s Declaration of Independence. NOTE: It wouldn’t be for another 13 years until Ecuador became fully independent on May 24th, 1822, after emerging as the victors of the epic and bloody Battle of Pichincha. Adding to this special occasion is the fact that Quito is also celebrating its 40th Anniversary as one of the first-ever UNESCO World Heritage Sites! Why does Quito’s Fiesta de la Luz revolve around light? The historic day carries a lot of weight due to the fact that Quito was one of the first cities in South America to announce its independence from Spanish rule. In effect, the declaration served as the spark that lit the flames of a revolution throughout the greater part of the South American continent. As such, the city is also often referred to as “Quito, Luz de America” (literally: Quito, the Light of America) in reference to the influence and impact it had on other countries in the region that were under Spanish rule at the time. When is Quito’s Fiesta de la Luz? Quito’s Festival of Light runs between the 8th and 12th, 2018, intentionally falling on the 10th of August so as to pay homage to the bit of history that the event seeks to commemorate. The event starts at 7 p.m. each night. This is the third consecutive year that the festival has been celebrated. Where is Quito’s Festival of Light held? The Festival of Light in Quito this year will focus on the major areas of the Old Town (Historic Center). In total, up to 18 spaces and facades, each within walking distance of each other, will be lit up and/or incorporate some sort of light exhibition. 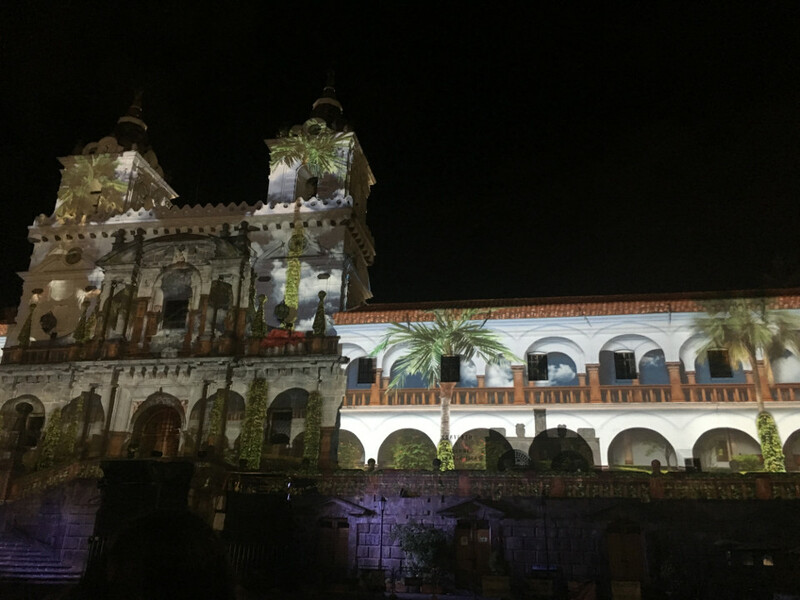 Notable edifices that will be lit up include: the San Francisco Church, the interior of the La Compania de Jesus Church, the Santo Domingo Church, Galapagos Street and the Queen’s Arch. IMPORTANT NOTE: The streets and sidewalks of Old Town during this event will be immensely crowded and transited during the event dates. For our guests and restaurant clientele at our Casa Gangotena Boutique Hotel, which is located right in the heart of Quito’s Colonial District, our rooftop terrace awaits to give them an astounding view of San Francisco Church and its spectacular light projection! How is the event celebrated? 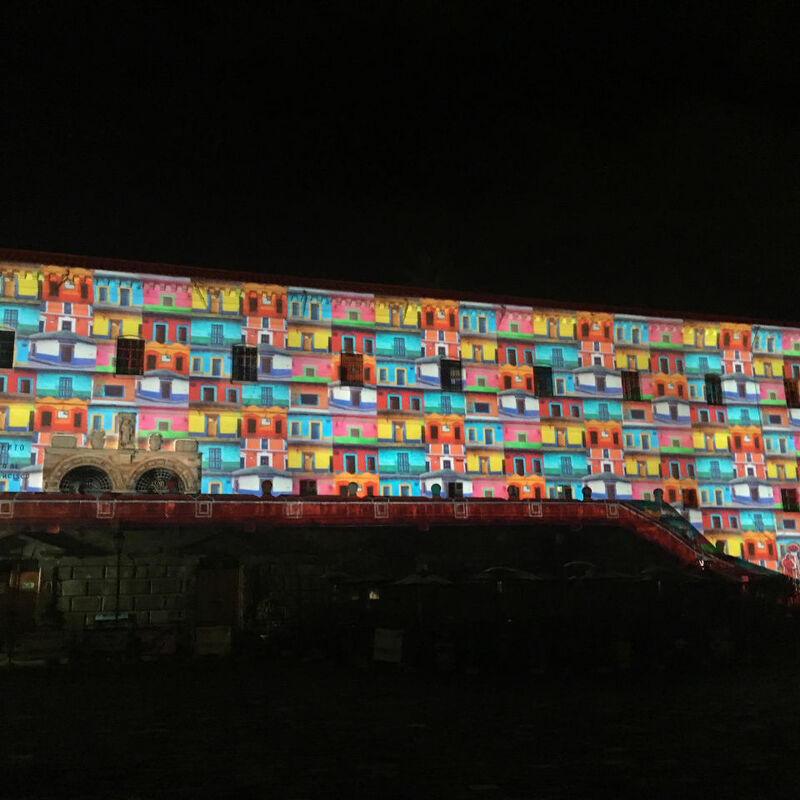 The history of the city and its magnificent architecture literally take the spotlight during Quito’s Fiesta de la Luz. 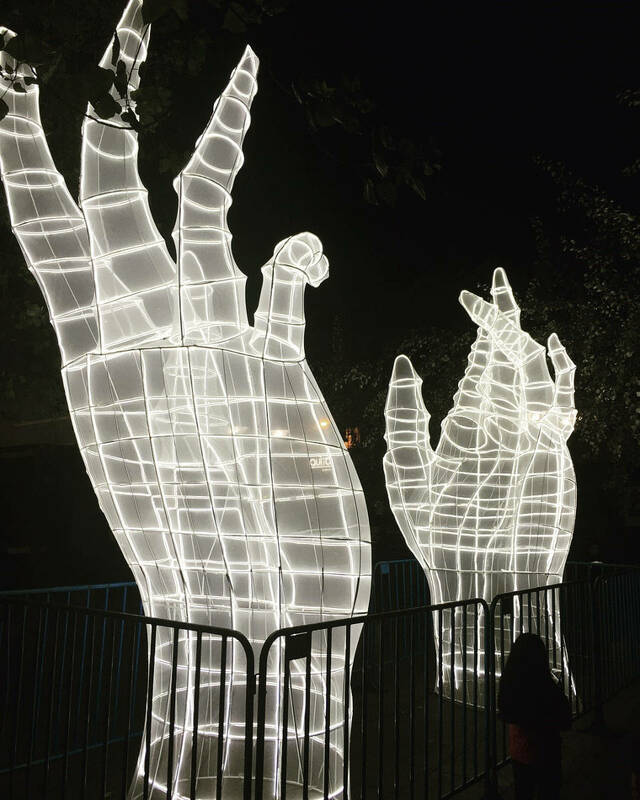 Artistic light projections and outdoor exhibitions imbue the Historic Center with an energy and illumination like never before. 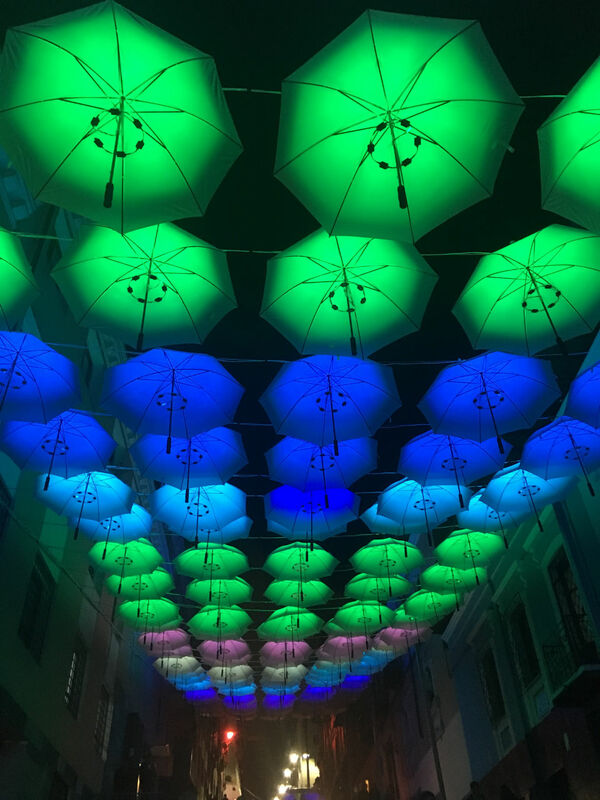 Quite literally, it allows visitors to admire the Historic Center’s plazas, churches and buildings under a new light. The major streets of Old Town during the evening of the event dates are completely closed off to traffic and are only accessible to pedestrians. The best way to enjoy this event is by venturing into the Old Town on foot! But keep in mind that, despite the fact that the Municipality and Metropolitan Police do their best to make sure the event runs smoothly and safely, we do recommend that guests leave their valuables and important documents back at their hotel. A jacket, camera and your sense of wonder are all that you need to bring with you! Or, avoid the crowds and head up to our rooftop terrace over at Casa Gangotena to enjoy a delicious signature cocktail or a warm beverage for those (usually) chilly Quito nights!